In her book Veronica’s Hero, co-authored by Jared Laskey, you can read Veronica Ortiz Rivera’s heartfelt story about the death of her husband, Javier a Marine who was killed in Afghanistan. This extract focuses on Miraculous Compassion. I had a renewed strength and some encouragement after leaving Dover, witnessing the honor paid in respect of my husband. I realized how much of a hero Javier truly was, and I decided I would pour all my energy into making sure he was honored as a hero and his story would be known. The casualty assistance officer, Orlando and I went to the airport in Philadelphia, but we learned that our seat assignments were not together. I didn’t want to sit alone, having grown dependent on having a familiar face nearby. Both Orlando and the captain tried to switch our seats with other passengers, but they were not willing. Watching people refuse their seats so I could at least have my brother-in-law sit next to me made me frustrated. “Don’t these people know? Don’t they care?” Feeling alone I started to cry. I sensed the woman sitting next to me was watching me cry, and even though I was mad at her for refusing to trade her seat, something drew me to want to be in her presence although I didn’t know her and had never met her before. With that, I cried more and I explained to her that my husband had been killed in Afghanistan. She grabbed my hand and asked if I wanted to talk about him. I explained how I had just watched the dignified transfer at Dover Air Force Base, that I was sad and afraid to live without him but very proud of him for his service to our country. She then said, “You know, my son died …” As she began to tell her story, her voice was sweet and comforting. After talking to me about her son, she finished, smiling at me. I asked her if my emotions were normal, if what I felt or didn’t feel was OK. I told her that at times, one minute of pain could be so overwhelming I wanted to die, and then at other times, I just wanted to laugh. I asked her how she was able to overcome the death of her son, and she told me God gave her what she needed exactly when she needed it. We talked throughout the flight. Before landing, she told me, “This was a divine appointment.” I thanked her for her kind words. We then landed and walked off the plane together. I had just caught up to Orlando and the captain wanting to tell them about the lady I sat next to. I saw her smile at me and then wink. But when I touched Orlando’s shoulder to tell him and looked back, she was gone. Veronica Ortiz Rivera is a mother of four healthy and very active children. Her life is a testimony of triumph over tragedy. She desires to honor her husband’s memory and help other people. She has traveled extensively to share her story. 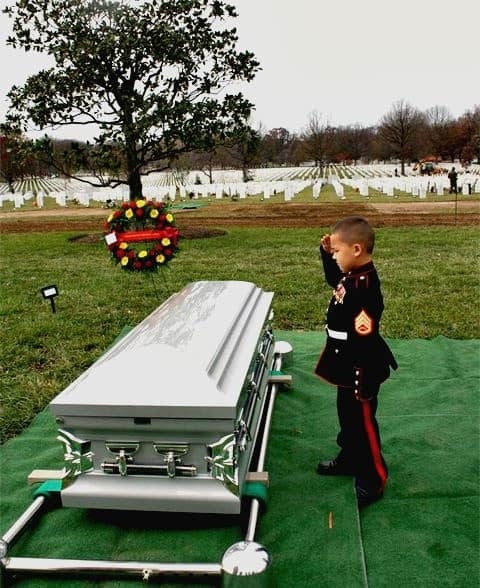 The Marine Corps is and always will be part of her life. Get your copy of Veronica’s Hero. Write an encouraging note or how her book has helped you by posting on the Veronica’s Hero Facebook page.